Here you will find the perfect Valentines Day wedding planning ideas from Chocolat (the movie released in 2000). The film featured some scenes shot on location at Brympton House. Brympton was once described as “the most incomparable house in Britain”. See more inside the house. Take inspiration for a Valentines Day wedding from Chocolat, the iconic romance starring Johnny Depp and Juliette Binoche. Based on Joanne Harris‘ book, the storyline is bursting with joie de vivre, colour and life. Scroll down to enjoy the images from an editorial I shot, featuring in this month’s issue of Your Bristol & Somerset Wedding. The movie’s main character Vianne – and her love of chocolate – sparked our inspiration. Luxurious chocolate truffles were made by hand at The Chocolate Society. They’re seen here in coordinating shades of burgundy, caramel and duck-egg blue. A decadent twist served at your cocktail hour, or a mouthwatering treat in favour boxes for your guests! 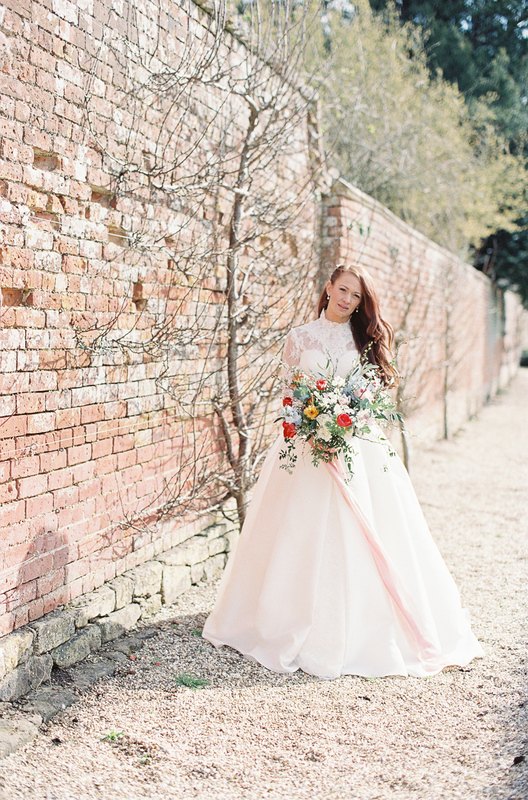 Our bride waited in excitement in the walled garden – preparing herself to walk the outdoor aisle to the temple – its brickwork brought to life again with a lush, verdant installation. I bet you’ll want to curl up together and watch the film. (Don’t forget the chocolates.) See the full gallery here. Get my guide to planning your own fine art wedding sent to you completely free, along with your no-obligation, personalised quote. This look would suit any outdoor wedding, country house wedding or destination wedding. Warm, joyful and honest, this wedding has a relaxed feel, with Brympton House pictured as a French Chateau. A riot of floral colour adorned our table on the terrace. Elegant, classic gold cutlery and beaded chargers are offset by the simple farmhouse furniture. Blush David Austin roses jostled with vibrant poppies, anemones, delphiniums and ranunculus. Delicate pops of purple come from the snakeshead fritillary and grape hyacinth.